There are a lot of rumors about the destruction in Aleppo old city . 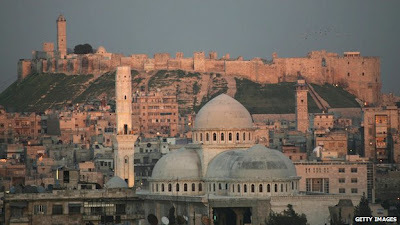 The old city of Aleppo considers one of the most important heritage of the humanity . The Syrian opposition has taken from its streets and old narrow passages bases to attack the Syrian army and to protect themselves from the raids of the the Syrian army . The most important location of the old city , Aleppo Citadel , still safe although the damage of its historical gate in late last July . The Syrian Republican Guard is protecting it and defending its symbolism as Aleppo international symbol . There are a lot of places which has been destructed during the fight , however , there are no much reports about it . The last attack on the Ommayad mosque of Aleppo left the mosque burnt and destructed . Its library has been stolen by the terrorists and parts of its building has been destructed . Syrian government has declared that it will re-habilitate it before the end of next year . Aleppo old city considers , currently , as the most dangerous location in Aleppo city .